Glue Dots - Invisible Solution. Visible Results. Standard Glue Dots provide a clean, instant bond and are often a preferred alternative to hot glues, liquid glues and tapes. Glue Dots leave no mess, residue or odor, presenting your product and preserving your brand, while increasing productivity and reducing costs. 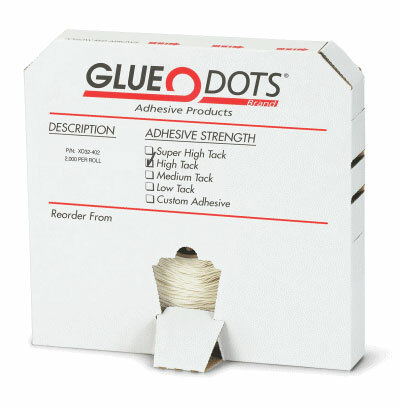 There is a Glue Dots adhesive for every application. Because the strength of the bond is substrate dependent, we recommend adequate testing to determine the proper tack level for your application. Glue Dots team of knowledgeable and helpful Account Specialists and engineers are available to offer recommendations and product samples for testing.